← What is a Virtual Operations Support Team? It seems almost everyday now I’m seeing tweets about apps being built by one emergency management agency or another. Today I’d like to highlight the two that were mentioned just this morning. 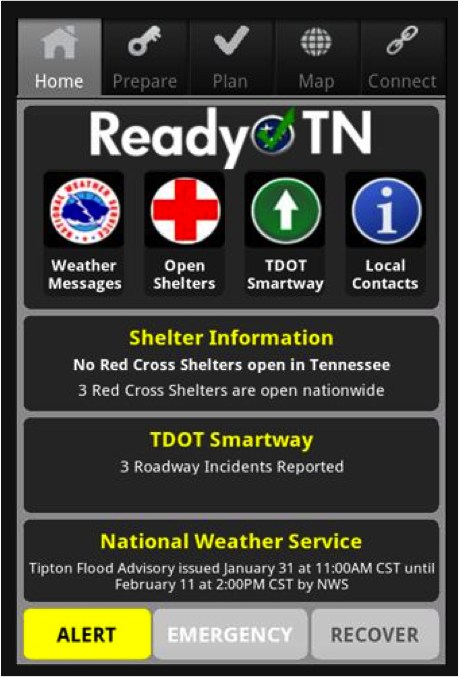 Tennessee Emergency Management Agency has released a “ReadyTN” application for Andriod. This application has all of the preparedness information that citizens would find on Ready.gov, but with the added benefit of being location aware. The GPS feature presumably can help people locate services, such as shelter locations and recovery operations, near them after a disaster. It also has a stream of data intended to increase risk awareness on the part of the citizen, but it seems for now the risks are limited to weather and roadway hazards. I’m sure this was a function of available data streams. Notifications are made simultaneously with the dispatch of paramedics to anyone within the area that is CPR-trained and has indicated their willingness and ability to assist during an SCA emergency. These notifications are only made if the victim is in a public place and only to potential rescuers that are in the immediate vicinity of the emergency. When notifications do occur they intend to target potential citizen rescuers that are primarily within walking distance of the event. The app also has other features which allows citizens to see select “emergency communication centers worldwide. Mobile users have real-time access to emergency activity as it’s occurring in these communities.” I’m guessing this would appeal to people that enjoy listening to fire scanners. In fact: “Users can also choose to be notified of incidents by type when they are dispatched and listen in on live emergency radio traffic via the modern version of the traditional fire scanner.” Interesting. Does your emergency management agency have an app? Please let me know. This entry was posted in Social Media and Emergency Management and tagged Cardiopulmonary resuscitation, CPR, Emergency management, Global Positioning System, GPS. Bookmark the permalink. Arlington County, VA has an app too–Arlington Prepares. The app helps people prepare for an emergency and includes contact information for agencies, utilities and much more. It allows people to pull in their existing contacts from their phone, access to up to the minute Arlington Alerts and a checklist to help keep track of what’s in your emergency kit. It is available for iPhone and Android users. Thank you so much for mentioning it! I will start a list of all these apps in the Resource section. The Arizona Division of Emergency Management (@AzEIN) has begun the development process too–http://www.azeinblog.blogspot.com. Nice post! We appreciated you featuring for our Emergency Kit Cook-off a few months back! Volunteering Queensland has a similar App call Ready QLD for iPhone. It has preparedness checklists, a news feed, emergency contact numbers, and videos. It also allows people to see what volunteering opportunities there are to help with clean up after disasters and other general volunteering opportunities, and allows the user to pre-register to be a volunteer. Thanks all for the information about your apps, I will have to write another post that highlights each of them. I’m especially interested in Ready QLD that lists volunteer opportunities. Very cool! Great to see +Kim Stephens post this morning on emergency related apps. In general I have been skeptical about many EM apps (particularly FEMA’s). Done correctly at the local level I can indeed see value and the example provided by Arlington County is a great testament of that. One observation however is that these apps can’t be static. Much like social media an app must provide real-time information to be relevant. It is actually ironic that she mentions Pulse Point in this story as I have been giving careful consideration to a way to deploy something like that in my county. Sadly, cost is a barrier to many real-time apps like Pulse Point because as anyone that has done CAD integration can tell you, getting your vendor to make their data accessible to other applications is not cheap or easy. Let that be a lesson for anyone creating an RFP for a CAD procurement, ensure that you specify an open and accessible API that will give you open standards to work with your own data outside the CAD environment. James–Thanks so much for this really great advice! Here’s another APP pointed out by Humanity Road: Quake SOS. One touch sends texts to your loved ones letting them know you are safe. Very cool! One addition to the App list might be Come Get Me app. You can designate an event (disaster lets say) and then you can show in a GIS evironment where the event “particpants” are. This allows for connecting family for reunification, CERT team lead accounting, etc. I also like QuakeViz because I am a Cali guy. Thanks for sharing. Good tip! I was also reminded that the Emergency Wiki 2.0 has a great list of Apps: http://emergency20wiki.org/wiki/index.php/Smartphone_Apps. Check it out!